The power distribution franchise in the City of San Fernando is held by the San Fernando Electric Light and Power Company (SFELAPCO). Of the 35 barangays, 34 are served by SFELAPCO. Barangay Pulung Bulu, due to its proximity with Angeles City, is served by the Angeles Electric Corporation with some portions of Barangay Telabastagan. The Local Water District (WD) supplies the drinking water for most of the households in the City of San Fernando. About 48.84% percent of the total households rely on the local water district for their drinking water; private shallow well at 17 percent; private deepwell at 13 percent; public deepwell at 10 percent; and public shallow well at 10 percent. Water Capacity - Total Daily Water Consumption = 20,040,186 cu.m. Despite the stiff competition offered by mobile phones over land line telephones, landline telephone subscribers in the City of San Fernando continue to increase. The combined subscribers of Philippine Long Distance Telephone Co. (PLDT) and DIGITEL communications as of 2005 were about 12,500 for a subscribed telephone density of 6 per 100 populations. The Angeles Industrial Park (AIP), formerly Holy Angel Industrial Park, is at the crossroads of City of San Fernando, Angeles City and Bacolor. It is the only industrial estate in this city. 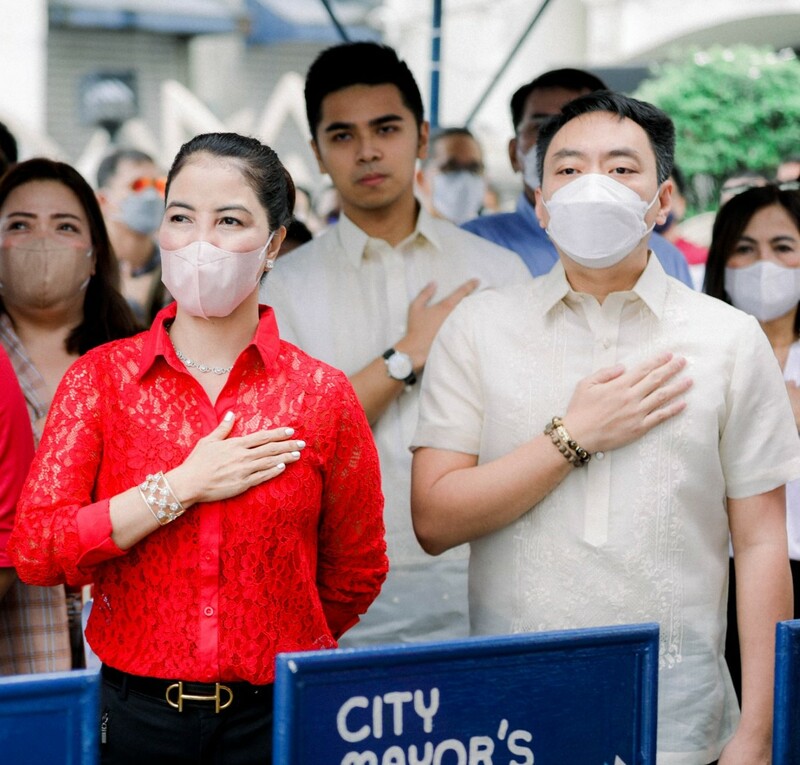 Although politically a part of Calibutbut, Bacolor, Pampanga, it is accessible only through the McArthur Highway in Telabastagan, City of San Fernando. Also, it is being served by the PLDT of City of San Fernando. 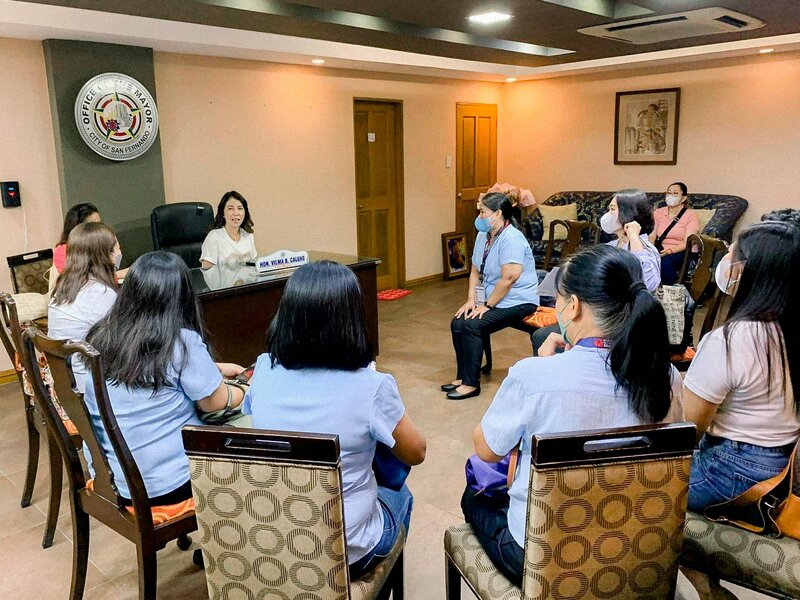 The city continued to strengthen its role as the education center of the province. Academic institutions from elementary to tertiary levels are found throughout the City of San Fernando. As of 2009, there are 49 Day Care Centers, 55 pre-elementary, 66 elementary, 25 secondary and 35 tertiary schools (including training institutions offering vocational courses) in San Fernando. The City serves as the provincial capital and site of most regional government agencies of Central Luzon. Its population has easy access to higher levels of health services such as specialty hospitals. It also hosts many health facilities e.g., clinics and health centers/stations. As of 2005, there are nine (9) hospitals, 67 clinics, and 4 rural health units operating in the City of San Fernando. The nine hospitals have a combined bed capacity of 616, two of which are government run. Among its famous recreation leisure facilities, the City has Hilaga Northern Philippines, formerly Paskuhan Village, a first of its kind in Asia. 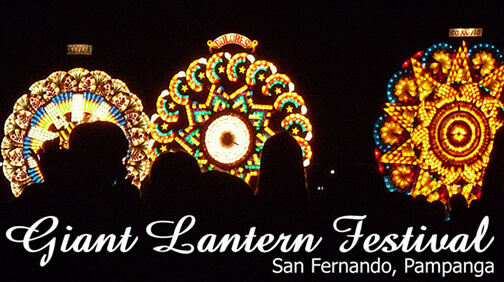 It is a tribute to Filipino craftsmen particularly the famous lantern makers of Pampanga as expressed by the star-shaped pavilion at the center of the village with its Gardens of the world and year round Christmas decorations. The Bren Z. Guiao Sports Complex and Convention Center, an impressive multi-purpose complex with imposing venues for concerts, convention, basketball games, beauty pageants and other sport activities. The 3,000-seat, air-conditioned convention center inside the complex is one of Pampanga’s pride. The Benigno Aquino Hall, located at the Provincial Capitol grounds was rehabilitated and expanded into a state-of-the-art conference center after it was ruined by lahar flows in 1995. The commercial/business center of the city goes as far as the stretch of City of San Fernando proper to Barangay Sindalan, about 8 kilometers in length and the Gapan-San Fernando-Olongapo (GSO) Road from Barangay Magliman to the Mexico boundary where the SM Department Store and Robinsons Department Store are located. 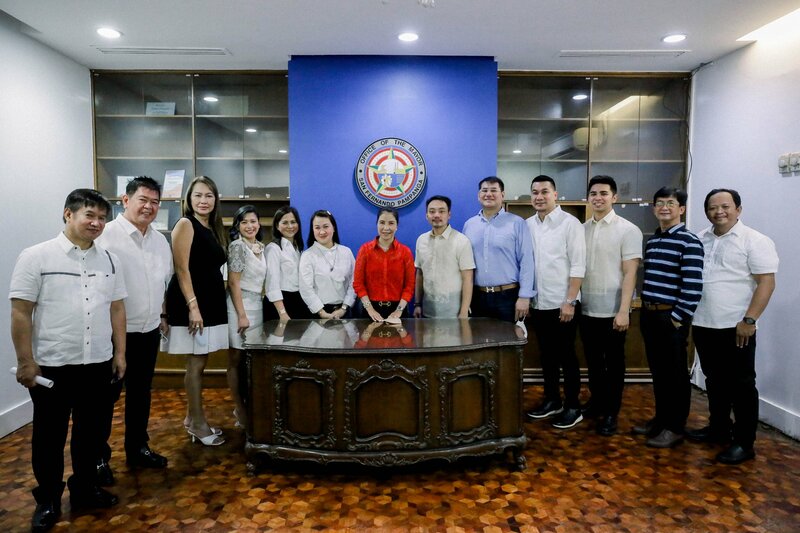 Aside from being the provincial capital, it is also the Regional Government Center of Central Luzon, where the Regional Development Council III (RDC-III) has set aside a portion of land for the Regional Offices of national agencies operating in the region. This has been a major influence in the economic development of the city. Some will argue that even if the City of San Fernando will not do anything, development and progress will spontaneously occur due mainly to its strategic location. That is true. But the negative impacts of urban sprawl, congestions, and conflicting use, among others will be inevitably experienced once the people of the City of San Fernando elected just to “wait for the things to happen”. The benefits of agglomeration and fruits of development can only be achieved and experienced, respectively, if its people will be responsible and proactive enough to “make things happen” within the principles of COMMON GOOD and not within the ambits of personal and individual glory. Like any other areas in the country, the pattern of settlement in the City of San Fernando originates from the Poblacion and radiates outward. As built-up areas grow and move away from the center, distantly located areas that are near or along roads directly leading to the Poblacion are the next best alternatives. The reason for this is very obvious – access and proximity. At present, settlements are amassed along major roads (i.e. Mac Arthur Hi-way and GSO road), secondary and feeder roads, and in the Poblacion. The eruption of Mt. Pinatubo in 1991 altered the urbanization pattern of the City of San Fernando especially those areas in the southern bank of GSO road down to the Poblacion, and all the way to the southern-most border of the city. While the threats of lahar flows greatly diminished over time, these areas are still being perennially flooded. Because of this, the process of expansion, densification and in-filling in the original built-up areas was arrested and moved to other alternative sites. Expansion of settlement northward accelerated starting from GSO road along the Mac Arthur Hi-way and its secondary or feeder roads.